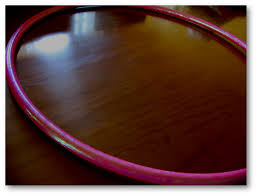 Pink Hula Hoop. Worse than a crime. Racism. Rice made the remarks at a press conference Friday at Newark Teachers Union headquarters. He was flanked by the city’s interim mayor, Luis Quintana, and an Assemblyman, Ralph Caputo, a former Essex County schools superintendent. In the audience were the leaders of statewide teachers unions and the president of the Newark school board. I don’t know whether Rice can prove superintendent Cami Anderson’s sale of Newark’s 18th Avenue School to the leaders of the TEAM Academy Charter Schools involved criminal activity. I think it was worse than a crime. I think it was racism. I think it demonstrated contempt for poor, powerless people. But no one ever gets indicted for racism and contempt for the poor. In Newark, they just get good jobs working in the school system—or in private companies that sell their products to school systems. Rice made some good points. If county or federal prosecutors really wanted to be aggressive, they probably could find ways of indicting a few well-placed people. Bidding laws may have been ignored. Maybe, too, the laws governing the closing of public schools. The strange cartel of profit and non-profit corporations involved in the purchase did not appear to meet the requirements for buying school property and converting it to charter school use. “The whole thing was engineered by (state Education Commissioner Christopher) Cerf to help his friend,” Rice said, referring to Timothy Carden, Cerf’s former business partner and head of most of the corporations that culminated in “Pink Hula Hoop,” a for-profit corporation that took title to the 18th Avenue School. But I have little hope that a county prosecutor who serves at the pleasure of Gov. Chris Christie or a federal prosecutor who has disappointingly shown little concern for the way his predecessor—also Chris Christie– behaved in office will be aggressive. 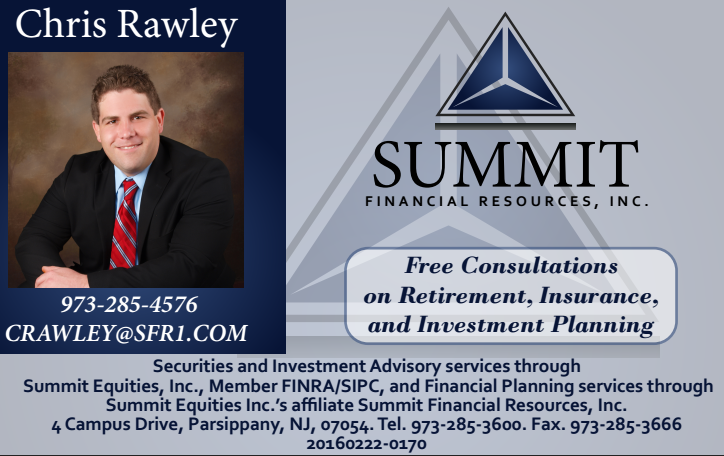 The best hope is that Rice will persuade the legislative leadership to let him conduct public hearings so that the people of Newark and New Jersey can see how shabbily people like Cerf and Anderson behave. Why do I call it racism? The story of the sale of the 18th Avenue School—the story of “Pink Hula Hoop”—dramatically illustrates how a small number of affluent and almost exclusively white people can conspire to bend a school system that serves a predominantly black and brown population to do their will. They have access to public money–$40 million—set aside for TEAM Academy by the board of the state Economic Development Authority (EDA), on which Carden served until a short while ago. They have access to smart lawyers who can tell them how to stay within the law and still get what they want. They have friends, like Cerf, in high places. They know how to persuade newspaper writers and other media workers that charters are the salvation of urban education. These are all things poor black and brown people do not have. They have been unable to tell the story of how the state, under the control of a right-wing GOP governor, has stripped the public schools of resources, called them failures, and awarded them to privatized charters. I don’t know whether Cerf genuinely believes his version of school “reform” will help. I don’t know whether Anderson genuinely thinks she is right. I see it is obvious that their ideology of reform through privatization serves their financial interests and those of their friends. And I also know that, because of their connections to the rich and politically powerful, to the Tim Cardens and the Chris Christies and the Joel Kleins and the Rupert Murdochs, they don’t have to be right. They can just impose their will on other people. They can just tell black and brown people, they can just tell poor people, to go to hell if they don’t like what they’re doing. Christie already did. Does it bother most people in New Jersey that the parents in Newark have nothing to say about the schools their children attend? Does it trouble the state’s residents that the voters in Newark can apply no leverage whatsoever to one state-appointed dictator who can sell public property on the cheap to people just like her—white, affluent, residents of nearby suburbs? No, I don’t think it does. Christie has done such an effective job inciting resentment against city residents, public education, public school employees, unions, and urban school systems that I am sure most people outside would either be indifferent toward or supportive of the disenfranchisement of the people of Newark. I am sure they applaud editorials that viciously depict opponents of Anderson as “shrill” and “shrieking” and “fiery” people—what they mean is scary black people—and buy into the false and slanderous narrative that Newark residents are so unruly and so dangerous that Anderson can no longer fulfill her responsibility to attend school board meetings. The truth is—as Rutgers law professor Paul Tractenberg has so eloquently put it—New Jersey, more than tolerates, it supports an “apartheid” school system. The Pink Hula Hoop scandal is part of that apartheid system. Racism isn’t a crime, but it should be. I have nothing more to add, but you’ve nailed it! Racist takeover of public education is the civil rights movement of our time. Readers need to call their legislators and demand that Sen Prez Sweeney grant the Joint Cmte on Pub Sch’s supeona power. This goes back to the foundations of our nation — Newark schools have become a colonial possession without representation, and the colonizers are doing what colonizers do. 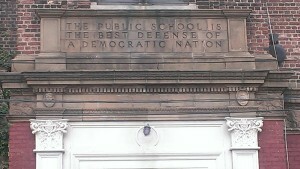 The parents and other citizens of Newark are entitled to their democratic rights to determine how their schools are run. But since the tax base is lower than the costs of the schools, Newark citizens have become 3/5ths of a person as far as local control of the district goes. Bob, it’s been so long since we’ve talked–but you keep hitting the nail on the head! I read your stuff on blue jersey and you are right on target. If you’re ever planning to be in my neighborhood (Plainfield) let me know so we can get together–interesting things, some of them not so nice, are happening in urban schools (including here) all the time, and not too many pay attention. I’m grateful to you for doing that. Excellent report. They named the entity Pink Hula Hoop to try to make it sound innocuous, but the name actually emphasizes how menacing it is. Like naming a pit bull Fluffy or Tiny. I agree with your analysis, Bob. The country was founded on the greed you describe. Yes, many don’t understand how racism underlies everything in our culture. Even Cami may think that she could never hold racist ideology because of her family. But that is when an analysis of racism is most needed. The dark forces of money, as Walter Farrell puts it, obscure the issue and corrupt our principles. We are seeing the very worst of venture capitalism here–where business can find ways to profit from the poorest, most disenfranchised and most powerless. Just look at the rapid privatization of prisons… so this is the next frontier? The most regressive powers that be use demonization and dehumanization of people of color as a justification for their policies. I am glad that you mentioned the “R” word. We could benefit from anti-racist community organizing workshops that are conducted by People’s Institute for Survival and Beyond. What has “been done to all of us” becomes very clear, and this clarity allows us to move forward with anti-racist principles a part of our organizing and advocacy. Check out People’s Institute (pisab.org.) Workshops are hosted by the Anti-Racist Alliance of North Jersey twice a year at NJCMD in Newark. There is a workshop being offered in May. I would like to organize one that targets education and the issues at hand. Anyone can contact me for more information. 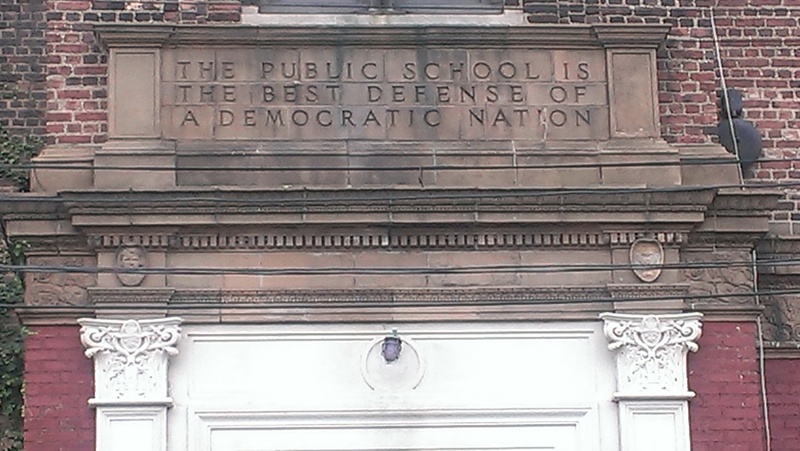 So says the front archway over the 18th Avenue School. The Christie Team mocks those words. So does Tom Moran over at the SL. A too cruel – and intolerable – irony. Sad but true. 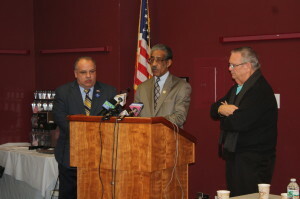 Quite shameful that “we the people” of NJ tolerate racism and political bossism this way. Tony Mack and Chris Christie; one is an elected political crook in Trenton and the other is short. Although I tend to share your pessimism Bob regarding the chances that the Pink Hula Hoop people will ever be prosecuted, I can’t help but hope and pray that something beyond public hearings to educate the public is done about this. It’s not enough to condemn these people morally – they don’t care what we think of them – the only thing that will ever give them pause is a criminal investigation. Yes, they may have experience that enables them to stay just within legal limits, but a criminal investigation where their names are linked to Anderson and Christie will at least hurt their reputations if not lead to any criminal prosecution. I believe that Rice should push for a complete investigation! Bob Braun: I don’t disagree, but these folks are lawyered up enough to give prosecutors a daunting challenge. Now that’s Gospel, or God Speak. Bob, I’m late on this but I think you’re completely right – racism BUT I also believe it involves destruction of the working class…it’s GREED, good ole’ American GREED – which has ruined everything decent in this country – healthcare, house care, food care, Wall Street smells the money…and sets its sights on acquiring it. Privatizing our whole world so that black folks and white folks become ‘slaves’ to the corporate cows. We don’t stand up together because we’re so damn tired trying to survive. Newark, Jersey City, Paterson, Plainfield, etc. become far-away-places that we notice in the headlines, yet really believe isn’t us. How stupid we’ve become, so intellectually unaware, so removed from our own victimization – so perfectly played! May God forgive us. Have you ever visited a TEAM school before? If so, can you tell us about it? Why the media blackout of this story? Try to mention Pink Hulahoop on nj.com or northjersey.com your account gets ghost banned or deleted.